I had the privilege of visiting Stylecraft Mill along with the other blogstars. and showered with gifts to share with you all! This is a 20% wool 80% acrylic mix with a speckled appearance. 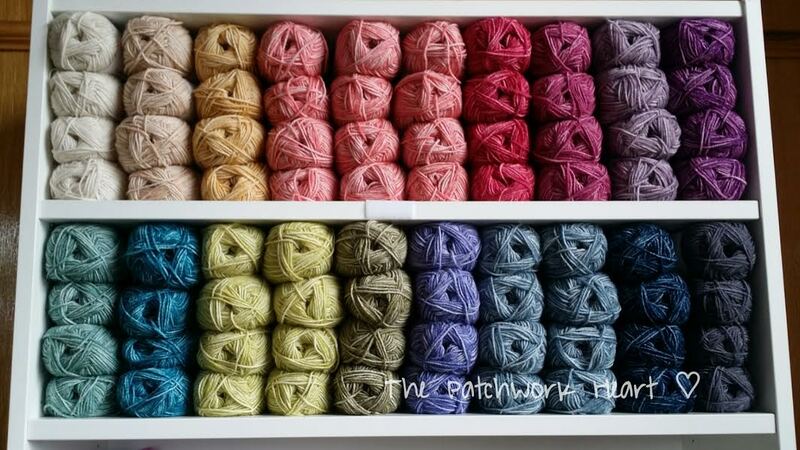 It comes in cute 50g balls and is available in 16 beautiful shades. that would showcase this new yarn. 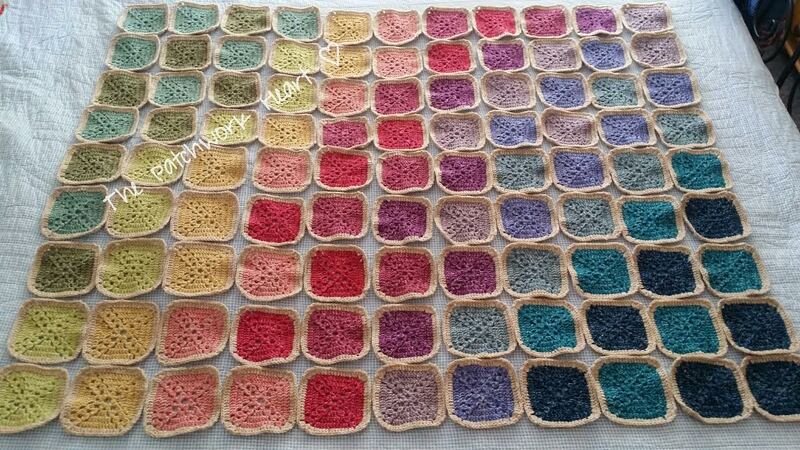 200 Crochet Blocks by Jan Eaton. 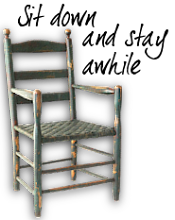 you can buy this from Amazon. so chose the Wisteria block and just made rounds 1 to 4. Playing with the colours is my favourite part! together, which is a joy for us crochet artists. biscuit for the joining and border. and the 5th round of each square I made in biscuit. Some balls made 7 squares and others made 8! and differences in my tension. which I arranged in a rectangle 9 x 11.
to make them look random. Well my trick is to play crochet Sudoku! in each row or column and it works well! was more special than this so I had a second play! This time I was happy, very happy indeed! from 1 corner of the rectangle to the opposite one. as you see it come together so fast. using UK dc through both loops. This gives a really strong join with a nice simple look. and here above you can see it with the first direction of joining done. and look what a wonderful surprise I found! a flower is formed from their 4 corners! and nothing to do with the joining method. there is another surprise to behold . . .
can you see the diagonal pattern made by the holes? has so much to delight in it! Here's a close up of the join and the formation of the flower. and smooth flat finish on the front. With the blanket complete it was time to choose the border. It is written in US terms and has written instructions and charts. after beginning with a foundation round of trebles first. telling me what you enjoy about my blog. to contact you in case you are the winner! so you have 2 weeks to enter! This blanket is a winner and it is a keeper! 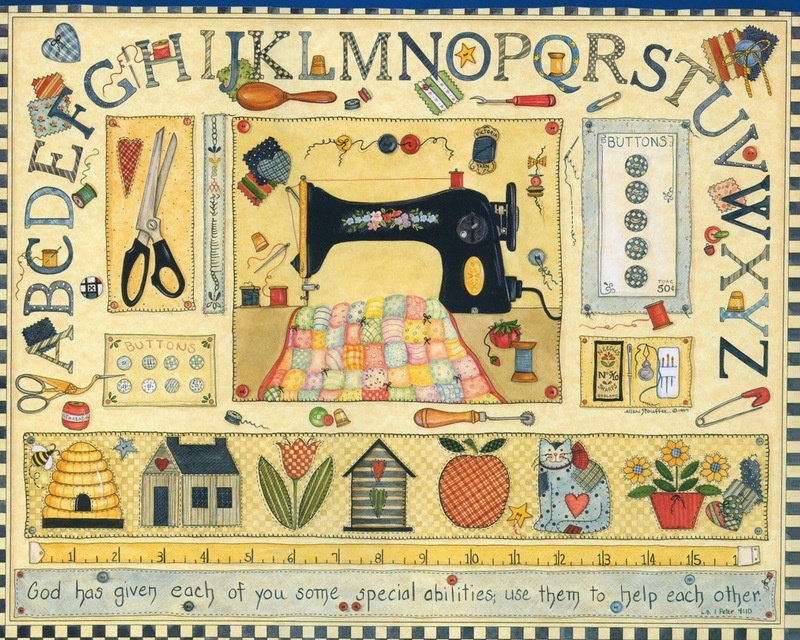 A new blanket for Patchwork House! 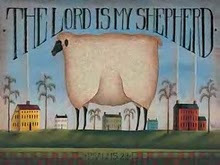 If you are not a fan of wool, do not despair! who either cannot wear wool or who would prefer a more affordable option. As you know I listen to all your comments and aim to please! and look forward to reading your comments. to be in with a chance of winning! I've only recently come across your blog and Facebook page! It's an absolute delight to see your posts daily, your work is amazing and inspiring! 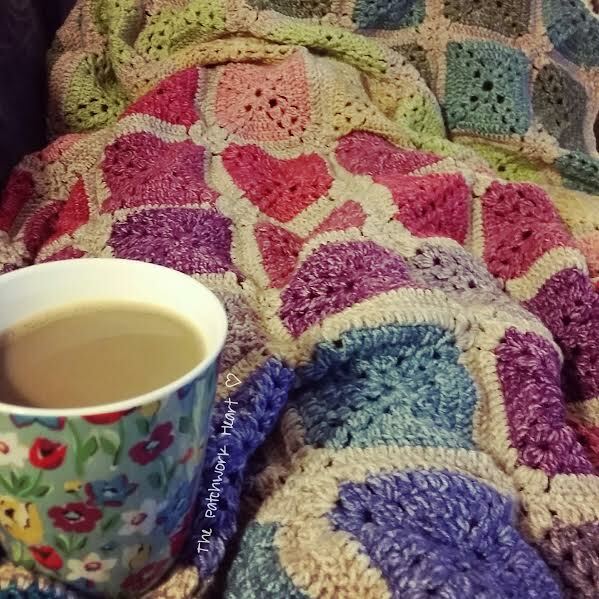 I only started to crochet myself in Feb this year, I sew (machine) as a 'day job' and crochet is my escape and I use it to relax of an evening but I also love to read your blog and posts as a way of chilling and finding new ideas for my next crochet project! Thank you! 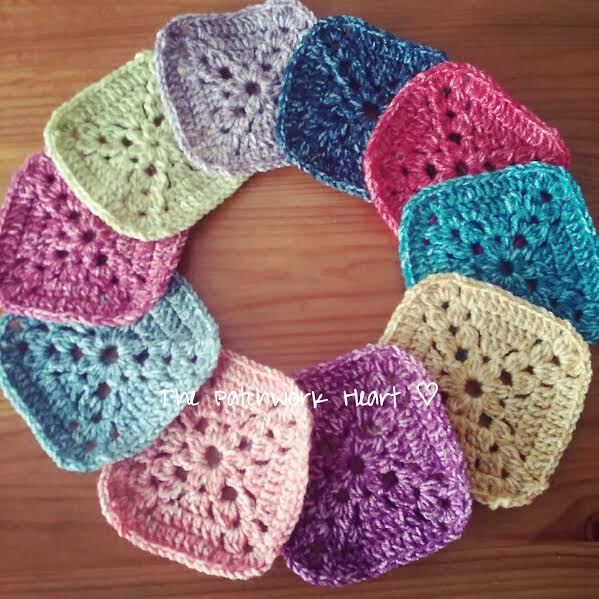 Love your blog Heather and have watched it grow and inspire like minded crocheteers for a while. 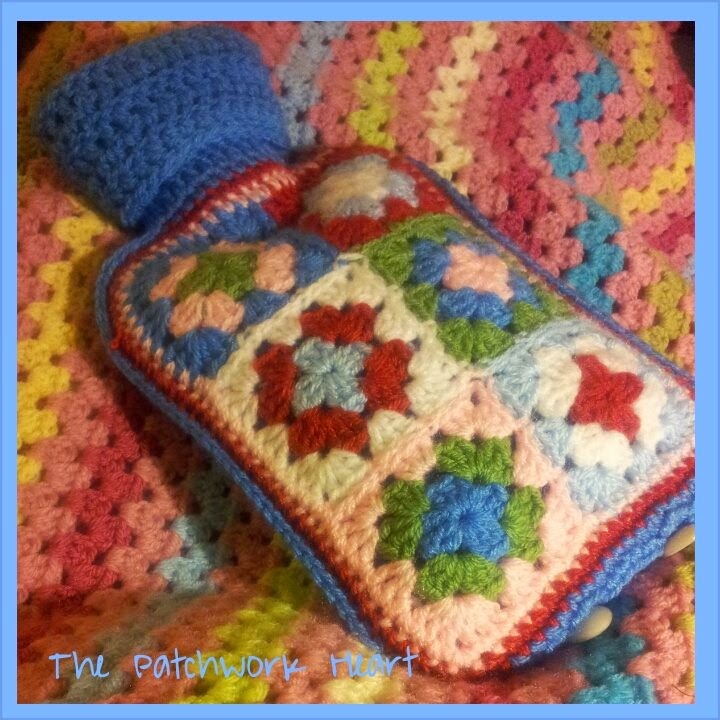 Love the colours you've used and also the lovely little flower formed when the squares are joined together. Very pretty Heather. What do I love about your blog? Gosh, where do I start! I love all the colours, and the combinations you choose, but I think more than anything, I love your generosity in sharing colour recipes, how to's, and all your wonderful photographs! Your blog is always a pleasure to visit, both in terms of friendliness and inspiration. 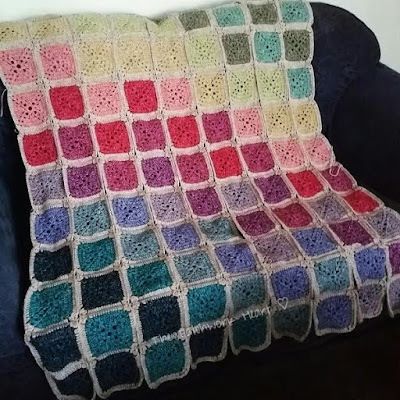 I love this blanket and the colours you have used. I always visit your blog to get colour inspiration and have recently used some of your rainbows for my blankets. Stylecraft yarn is my go to yarn and also use it for amigurumi as it works up really well. I'm inspired now to try the batik yarn and to make a lovely snuggly blanket for myself! I love this rainbow blanket so much. 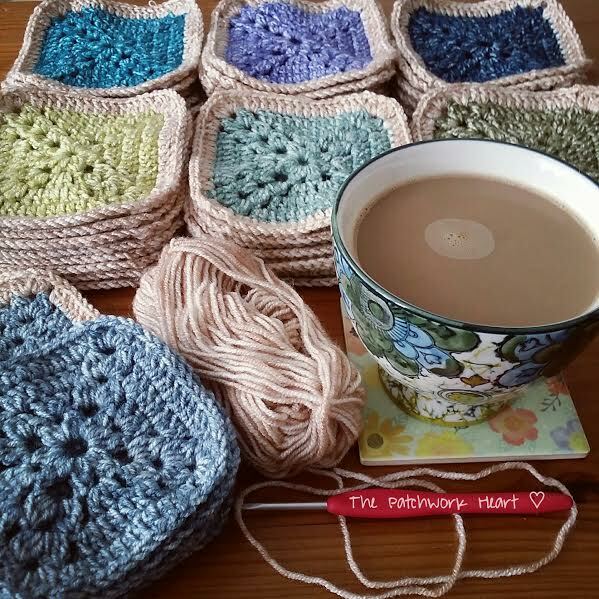 My favourite thing about your blog is #mugshots I love how your photos show your crochet environment is the same as most of us, with a cuppa! 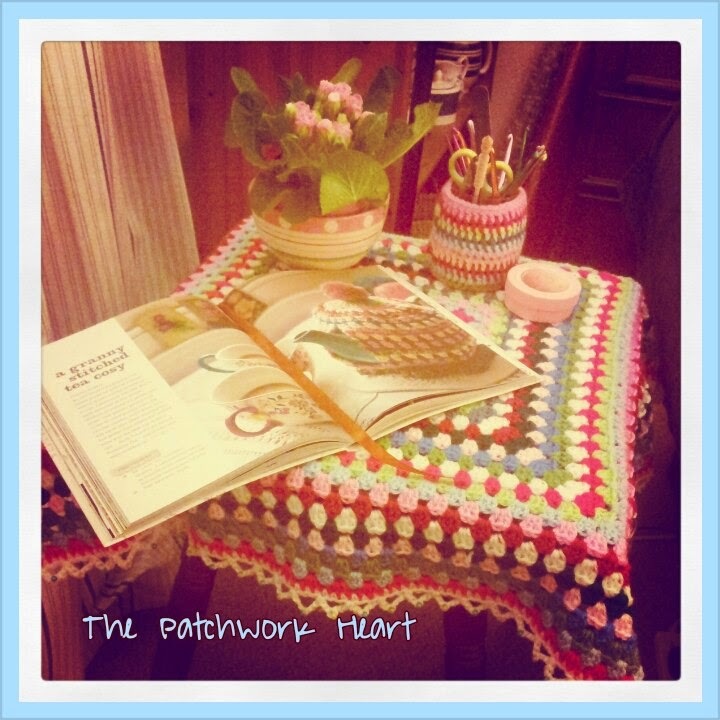 Your Patchwork Heart blog has been an inspiration to me. When the mundanity of everyday life gets me down, seeing your colourful creations restores my spirits and motivates me to get out my wool for a while. Thank you so much for showing your work. I for one, greatly appreciate it. I have been following you on Facebook for some time and I just love watching through you posts how your projects grow and become beautiful works of art. 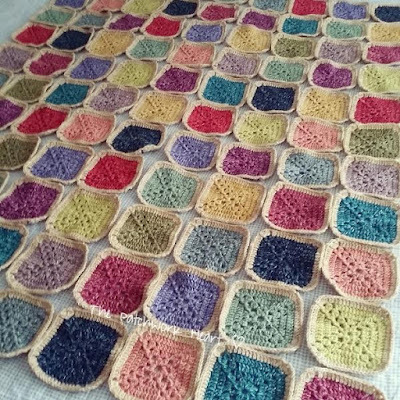 Through reading your comments and following your helpful comments my tension has inproved tremendously and I have made, to me, the perfect granny square cushion cover, that for once isn't misshapen. I have only recently found your blog, and love your use of colour and the information you give in relation to patterns used for blocks, joining and borders!! Thank you!!! Your blog posts always inspire me to pick up my hook, even if I don't feel like crocheting, your colour combos, patterns and designs are always beautiful, love to see notifications pop up about new posts from you! 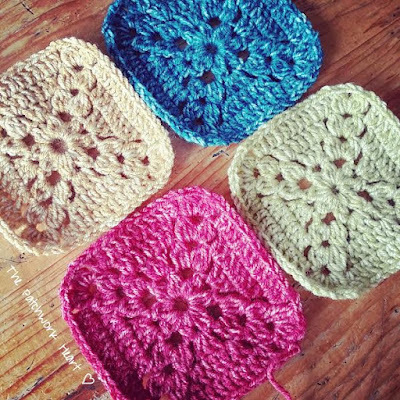 Amazing post Heather, I too use your same method when deciding where to place the squares. I love the way and style you've decided on. Plus the join looks amazing with the corners meeting and creating a sweet little flower! I love visiting your blog, it's full of inspirational projects and great tutorials. If I'm ever in doubt I always stop by and check if it's something you've covered. I love your colour recipes! You're so good at putting them together. I love to marvel at just how fast your creations fly off your hook when mine seem to take ages! Such beautiful blankets and inspiring ideas. Thank you. Crocheting is a wonderful pastime that has many benefits. Your work is inspiring and brings people together in a positive way. 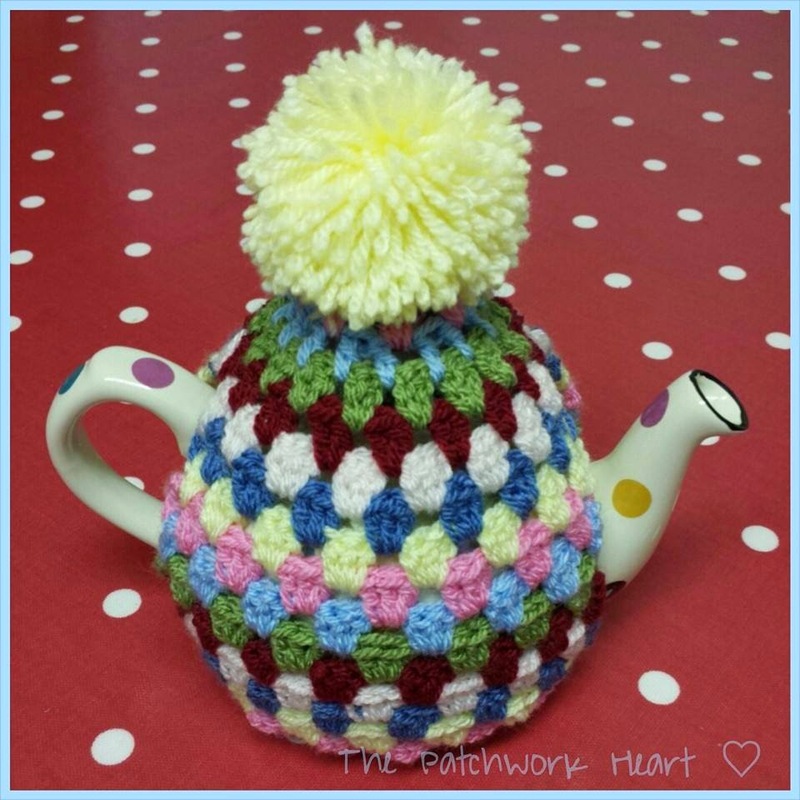 It's lovely to see beautiful posts showing peoples work, sharing knowledge, offering support. 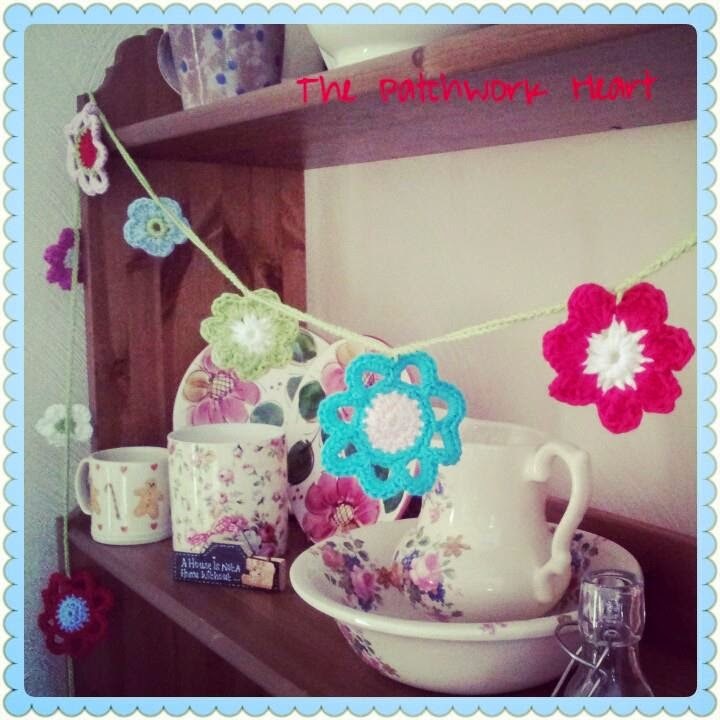 I love our hooky community and happily pass on my knowledge/skills (such as they are) spreading the crafty love. Heather, I've said it a millions times before but I'd love to say it again. This is just gorgeous as is all your work. Love seeing every single post/blog. Your colour arranging is always spot in. Thank you for inspiring me! Ohhh my God, lovely blanket, you always make me feel the necessity to start crocheting when I see your posts. I always visit your blogs when I'm in need of inspiration. Your colour choices are amazing. Your instructions are so clear and easy to follow. 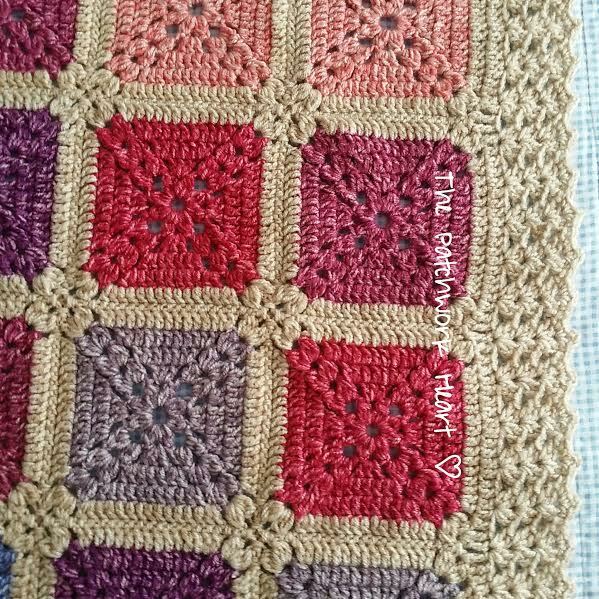 I love the little flower shapes that appear in the corners of the latest blanket, I hope I can recreate them. I love the way you combine colours and that you are so willing to share your creativity and knowledge. Heather, your blanket is absolutely beautiful! It is really interesting to see both layouts and how the second one really makes the colours sing. It's a stunner😍. 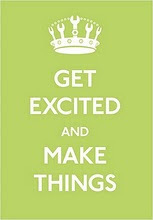 Your use of colour and your lovely patterns inspire me to keep making things. Thank you very much. 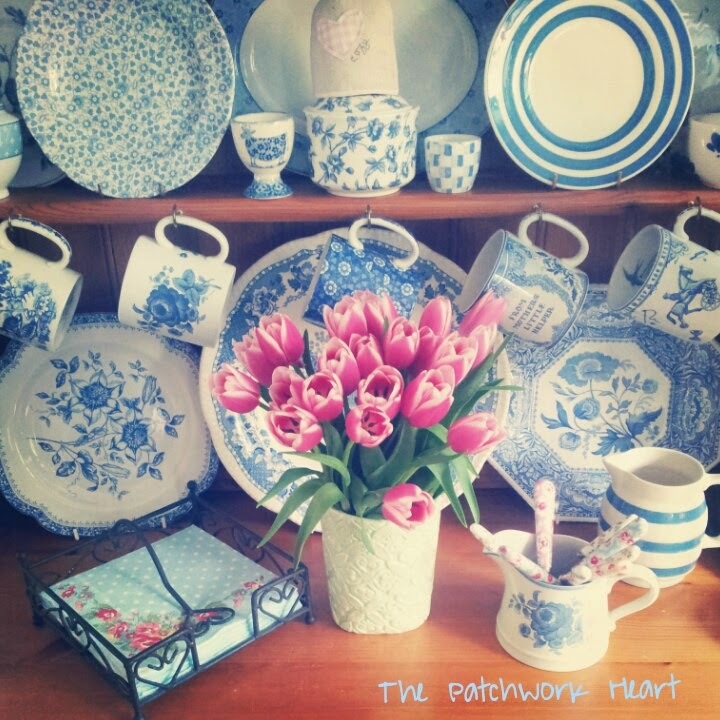 I love the 'realness' of the Patchwork Heart. It makes me feel as though 'I can'do these things with Heather's help. Always love your blankets and the colours. 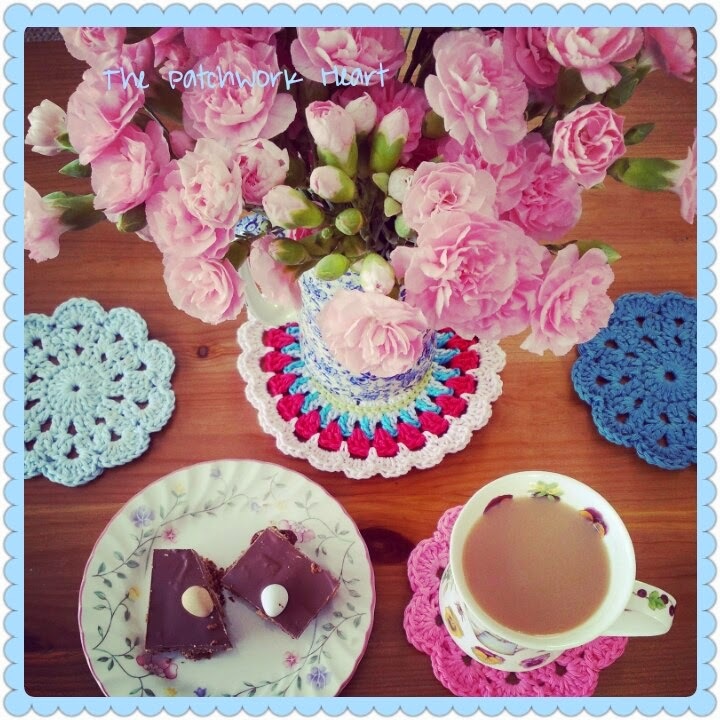 I am always worried about colour combinations but your blog gives me confidence to try. Sorry I cannot compete because I live in the US. But I wanted to say WOW! and thank you for a great blog/tutorial. Lovely work and great explanation and hints. I have followed your blog for a long time, you are so clever putting colours together, it is always a joy to see your completed blankets, a feast for sore eyes. Keep up with your beautiful creations you have such talent and inspire so many people including myself. 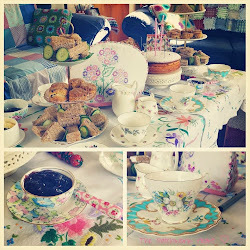 I love your blog as you have beautiful colour combinations in your creations. Stylecraft is my favourite yarn brand so I get inspiration from your designs. I also love your mug collection. You inspire me greatly. You seem to work so fast that every time I visit there is something new to drool over. I love your colour combinations. Your blankets always look stunning. I love being introduced to new patterns and shapes that I wouldn't have come across on my own. Thank you for your kindness! What I love about your blog is that you give so much detail so as I can take inspiration from what you do without having to ask you questions, as you answer all questions I would have in your blog posts! Absolutely love this Batik blanket, it's simply amazing! Can't wait to see what you do with the other Stylecraft flecked one, too, as a more affordable option. Hopefully you can find my email address if by any chance I win, if not if you reply to this comment it should email me to notify me about the comment and then I can send it through to you properly. I'm a relative newcomer to your blog, but I just love it so much. It's bright and clear and most of the patterns and items you show speak to me! Thank you for sharing your talent and ideas with the world. I find your blogs are an absolute delight to read and I love the way you are inspired by colours iwe use in our everyday life, so simple yet so effective. 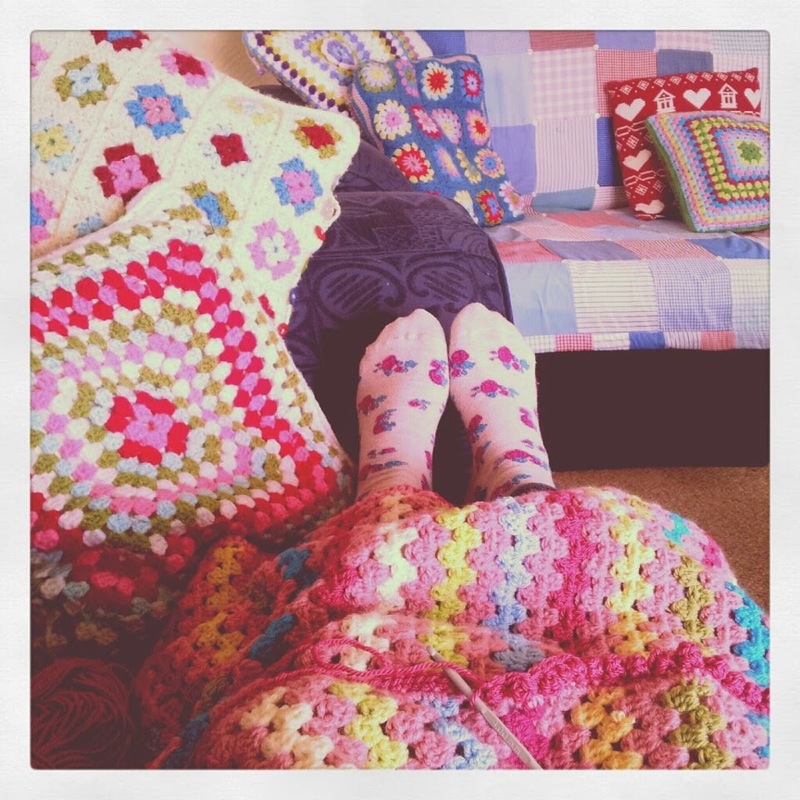 I love your blog it's very inspiring, the coulourful blankets are lovely. Gorgeous.....as is all your work...I love it all and am always amazed at how quickly you create. The Batik is a lovely gentle effect and everything I have seen in it so far I wish to make. 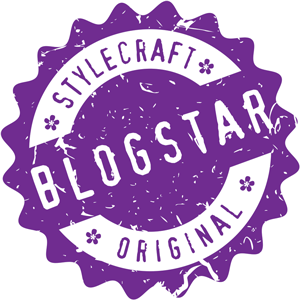 Stylecraft have created a real winner in this one! 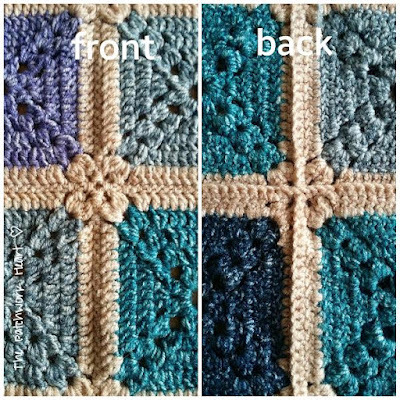 Cannot thank you enough for all the tips and techniques you share, it is invaluable advice for those of us who crochet alone ...no groups where I live unfortunately. 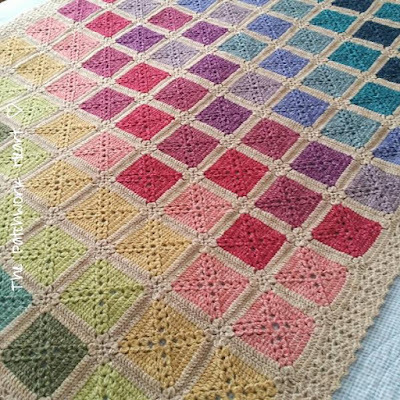 The thing I love most about your blog is your sheer generosity in sharing such stunning design and colour work and I am in awe of the speed you crochet. You must be the fastest crocheter ever. 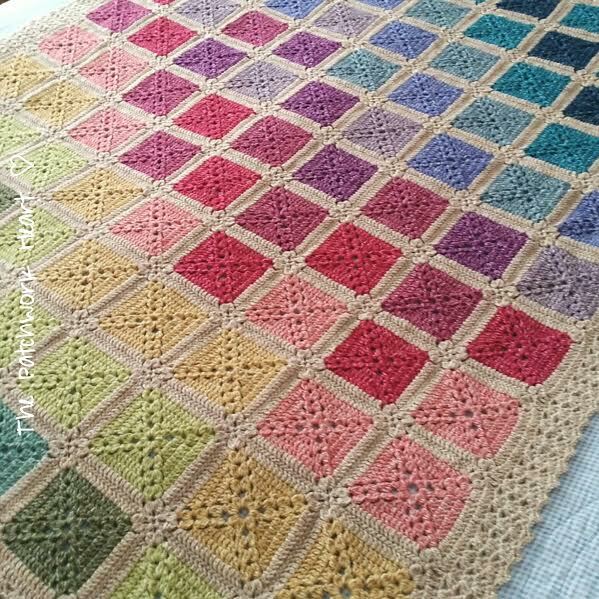 I love this design - your blog shows clearly the process used for the construction of this blanket & how you made the striking design using these delicious yarns. I really like the shades of this yarn - clear but soft. Beautifully made Heather, as always. I love your blog! You have such a way with color, it saves me so much time trying to decide what colors go together. Thank you for sharing and I can't wait to see what you come up with next! Thanks for being such an inspiration, Heather. This latest blanket is as beautiful as the rest. 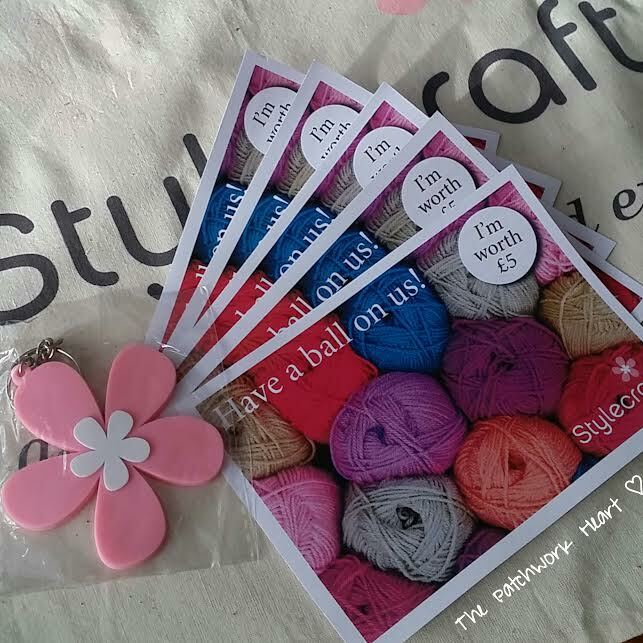 Although I do not live in the UK, my Daughter, Robyn,will be visiting shortly and would love her to get some Stylecraft while she is there. I have been crotch ting for hears and she has recently picked it up. Have an awesome day! I like your blog because it feels so cosy, with the flowers in the background. I also like the colours you always use and the many magnificent pictures. 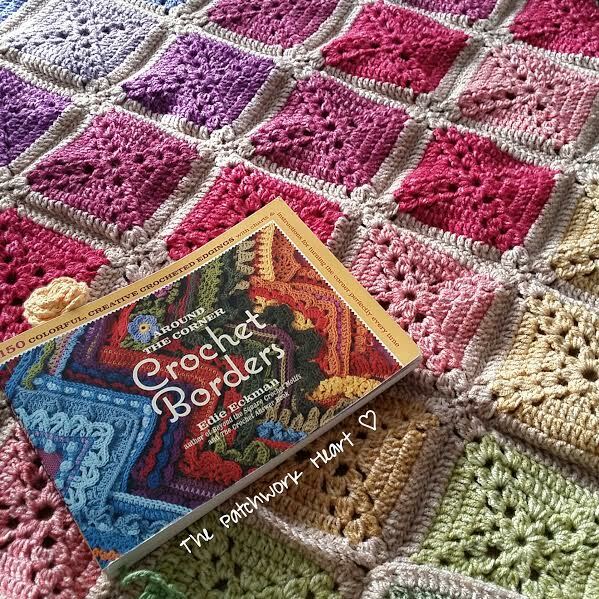 You have inspired me to pick up my crochet hook again, I love your choice of colours. Of course I love the actual crochet, your work is beautiful, but I think my most favourite thing when I come to read your blog, is seeing all the different colour combinations you choose, you have a real knack for it! This blanket is just stunning! 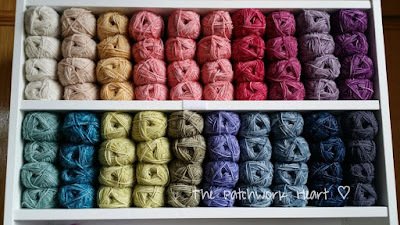 I've recently discovered this yarn but didn't realise there were so many colours (the shop I go to is quite small so has limited stock!). I can feel some internet shopping heading my way! Your blog is the equivalent of curling up with a good book and a slice of cake on a rainy day. It's unpretentious, genuine and inspiring. There's very little ego within it which is incredibly refreshing. I love how helpful and generous you are - taking time to always share your colour recipes and your progress, allowing us a Facebook group to share our work and discuss and support each other, and taking time to make tutorials - the number of photos and amount of detail shows how long these must take, but it is very appreciated. This might be one of my favourite of your creations - how beautiful! What I always find amazing is how prolific you are in you're crocheting. No sooner is one masterpiece off the hook, another begins and the best bit is you find more time to share it with so many of us minions! Thanks! I love how detailed you are, the little flower in the biscuit joins are just the perfect little touch. You have helped me develop so much as a crocheter. I absolutely love that blanket! The colours are divine and they work so well together. I am definitely going to have to get myself some of that yarn. 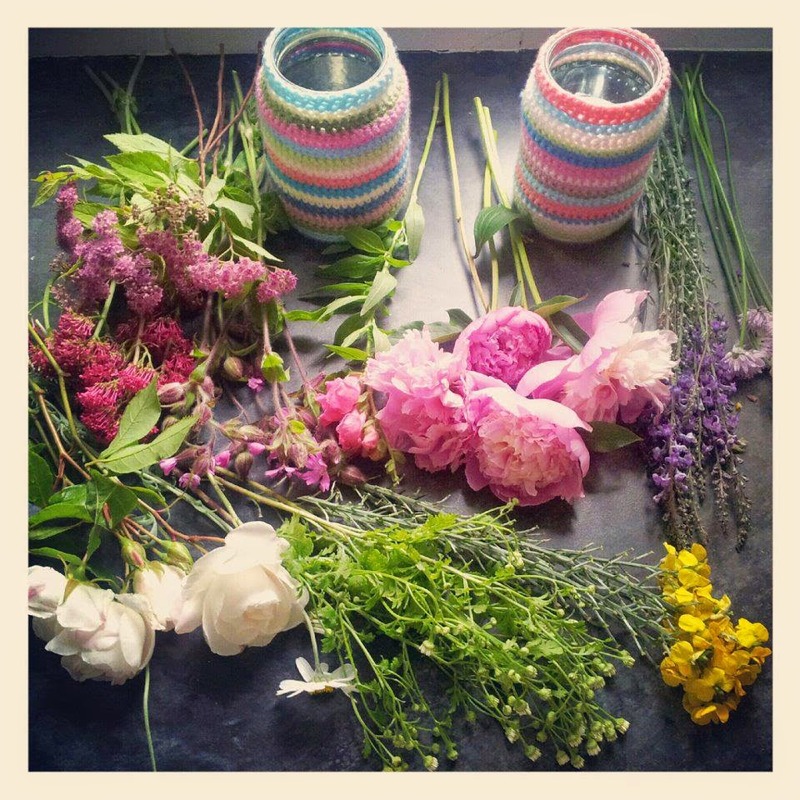 What I love most about your blog is the colour inspiration and the beautiful things you create. You are an inspiration. I have been crocheting for less than a year. I only came across your lovely blog about 2 months ago but now refer to it all the time. I trust your colour combos 100% and your tutorials and the wonderful photography inspire me to create more and more....and more. Hmmmm. I think I need to start selling some of the many blankets I have now made!!! I love this tutorial! It's fool proof! Such lovely photography too. 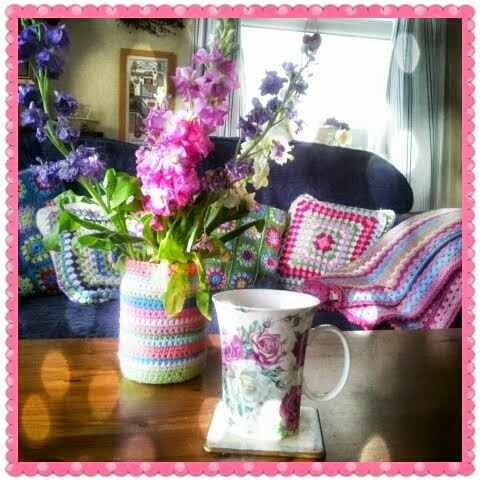 Love the blog, just coming back to crocheting, find it therapeutic helping me to relax. 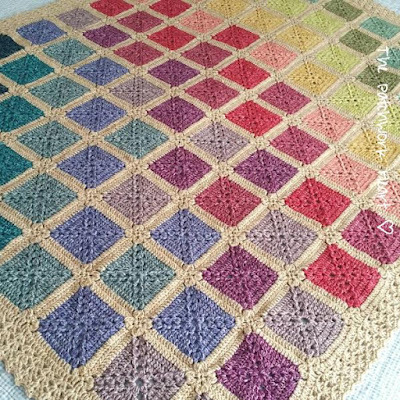 Never tried making a blanket with the squares.....didn't realise you crochet them together. 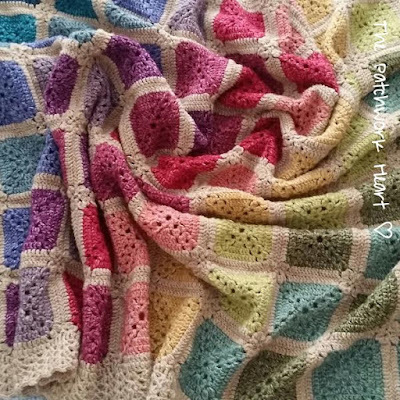 What a beautiful blanket, I would love to make this, please include me in the draw, Natalie. I love how you've showcased the new colours the blanket looks gorgeous. Hi Heather. 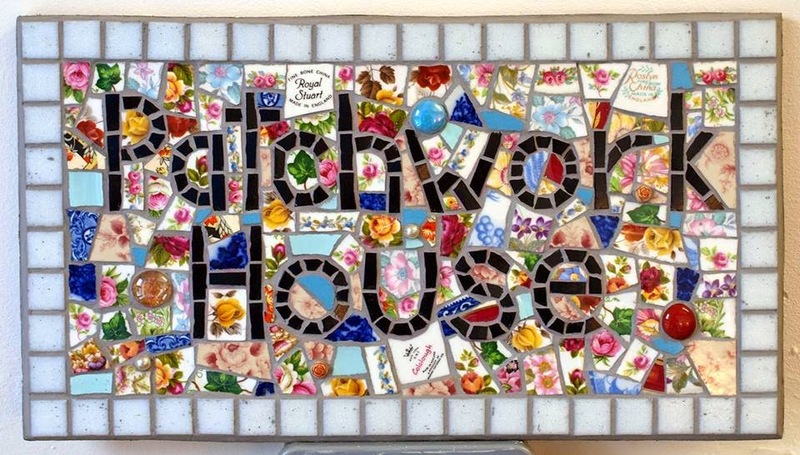 I love your blog as it took me back to my childhood and as a result of it inspired me to take a course at Love Stitch Heswall and I haven't looked back. Your colours patterns combinations are what gives it such a homely feel. Don't ever stop. I can be found on Face book message Jayne Wilkinson or lately at Love Stitch coffee and crochet on Fridays. Thank you, Heather, for sharing your work with us all. You are such an inspiration both in your colour & pattern choice. I have learnt such a lot from you. I also enjoy your blog. This batik blanket is just beautiful. I love to see your work, you truly are an inspiration to a novice crotcheter like me. I always feel encouraged to have a go myself as you explain everything so clearly in your blog. I love your designs. What I particularly like is your step by step process complete with photographs. It makes it so much easier to follow and lovely to see the complete item come to life! Really a joy to read! I love reading your blogs because I find they are very clear and informative. 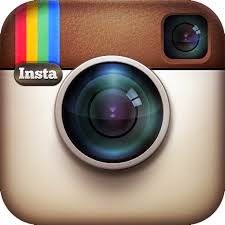 The photos you use are great and the colours are spectacular. The tutorials are excellent especially for a beginner. I use your colours as inspiration for some of my own projects, I am new to crochet and find your blog helpful for hints and tips when I struggle, the willow square you did a break down of was most useful to me as I am only just getting there when reading a pattern. I use your colour inspiration for some of my own projects, you make it look really easy and everything you make always looks beautiful. 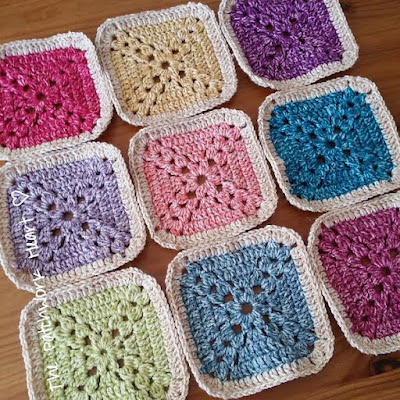 I am new to crochet and find your blog helps me with hints and tips when I struggle, I mastered the willow square thanks to your break down and the pictures. I love lots of things about your blog but my most favourite part is probably your pictures. I love the way there are lots of close-ups with all the yarn details makes/colours. Hi heather, your work and posts are such a joy to see on Instagram. Your work is such an inspiration and soo beautiful with the array of colour palettes you use. Love Stylecraft yarns and have felt the batik, not used it YET but seeing your blanket think I have to. Not sure if my email will show on my previous post so exspal@gmail.com ! 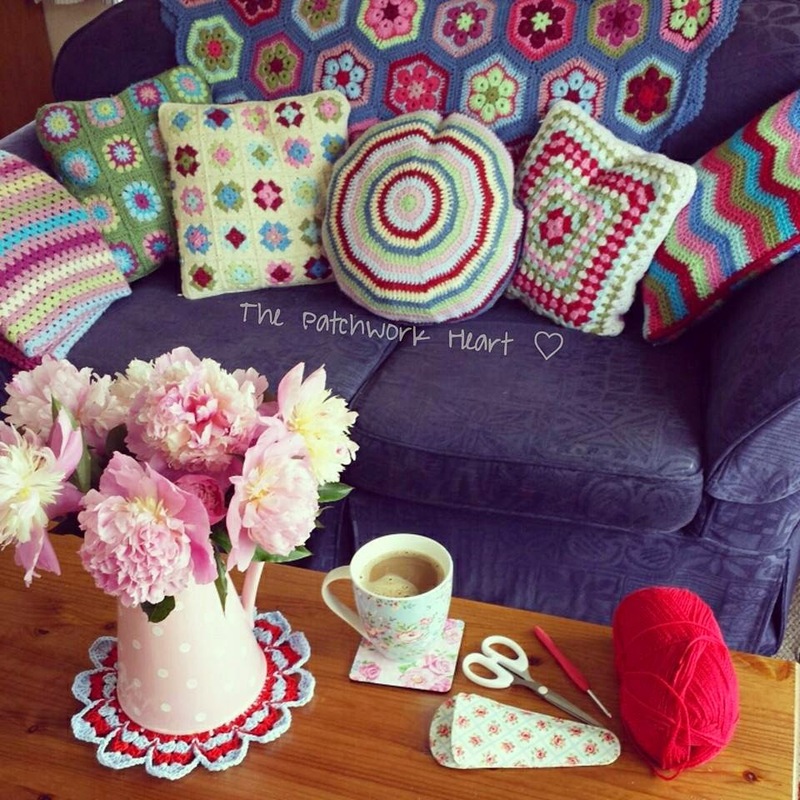 I found you on Instagram and Facebook page when searching for crochet inspiration. Your work, colour choices and patterns have inspired me to get the crochet hook out again. I am hooked again and cannot put my crochet down. 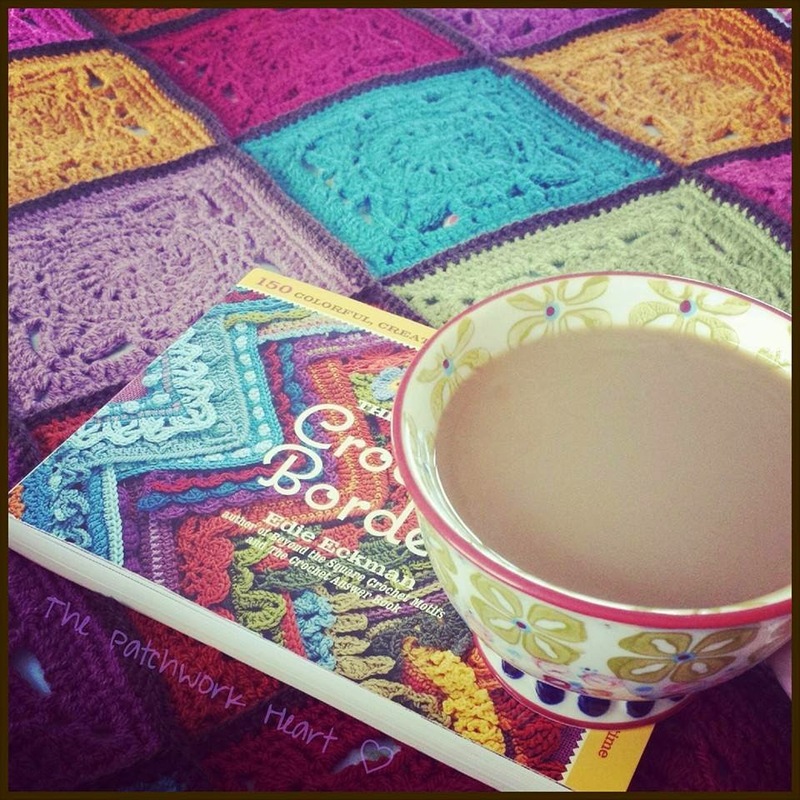 I love reading your posts and marvel at the speed you crochet. I've been following your blog and fb page for a long time. I love your use of colour and the variety of blankets that you produce -at an incredible rate! The thing I enjoy the most is your gorgeous photos, you always have something pretty and lovely to look at which gets my day off to a good start as I browse fb over my morning coffee. I love this batik blanket; your posts about using it have inspired me to try it for myself, especially as I am already a big fan of Stylecraft special dk. I absolutely love your blog if I had to pick a favourite section, I have two! I love your tutorials, especially the CJAYG method and the makes of the month section, I love seeing all the projects you have done in a month. Plus I love all the colours you use and how you put then together. When I'm at work counting down the hours and dreaming woolly thoughts your daily blogs lift my spirits and make me smile. I've followed you for a while now and love your inspiration, the colours you put together and the tutorials. Many thanks for the chance to win. 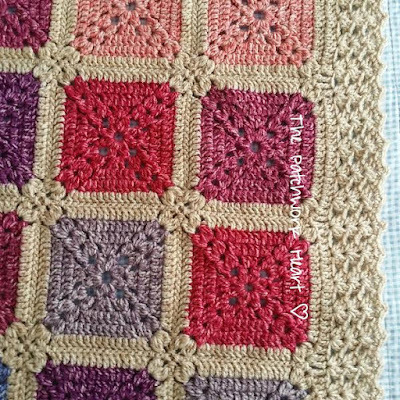 I love your blog because you have inspired me to take my crochet beyond the granny square with Willow blocks and others from Jan's book (you should be on commission ;-) ) and corner to corner, and I'm still waiting to try v stitch! Your step by step tutorials have also been a big help and currently working on Willow blocks that I want to join with a braid. Thank you for all you do to encourage and inspire and the way you respond to individuals on your FB pages. I love your blog because of the sense of colour in everything you do! I love your blog and how clear and colourful your pictures are, it's such a joy to read your passionate words alongside those lovely pictures. I love how your blog is so informative, and the colour combo's you use. And that you are more han happy to share yarn colours and patterns. Your photography is also beautiful !! 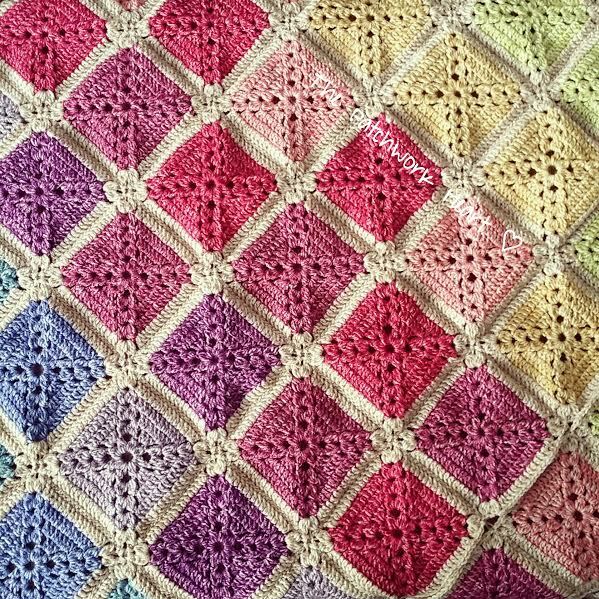 Another gorgeous blanket Heather! This one is just beautiful...you've made me really keen to try this yarn now. I find your blog very inspirational. Sharing your journey with chronic ill health has helped me deal with my similar journey. 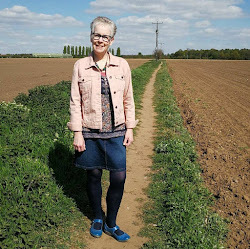 I love your eye for colour, and I find it refreshing to find a blogger who willingly shares her pattern and colour details. Good luck in your new chapter Heather. Love you blog and colour combinations. This blanket is gorgeous. It's definitely going on my to do list. I use style craft all the time, but not had chance to use the batik yarn yet. Your so inspiring, your tutorials are very effective and thorough. 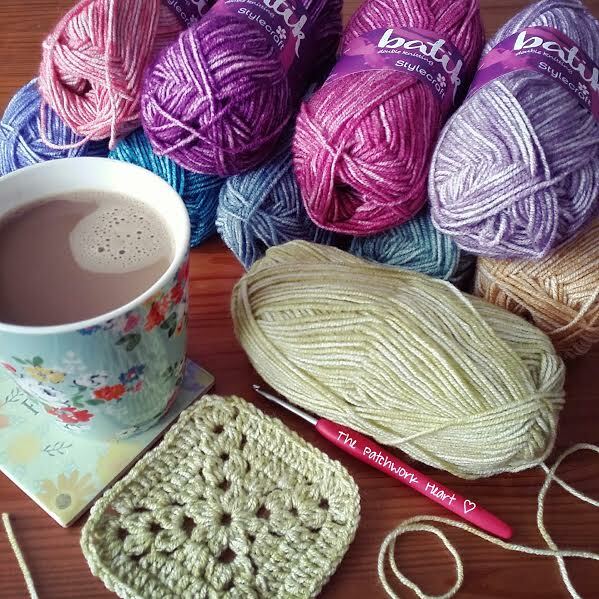 There's just many things to love about your blog and social media, I agree with another comment that crochet is everything but we all have our troubles but at the end of the day... Crochet is our little comfort zone and it's just like therapy. 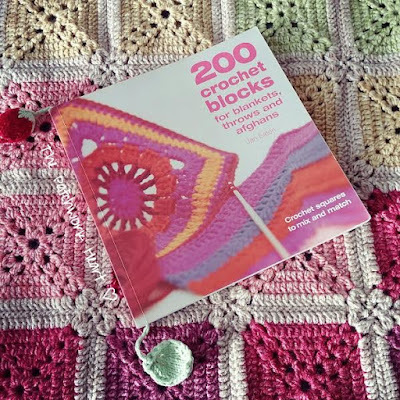 I love reading your blog and also Facebook page .Your work has given me the motivation to sign up for a beginner's crochet course at the end of September! Your work is beautiful and has made me look at crochet in New way.I look forward to your posts ! 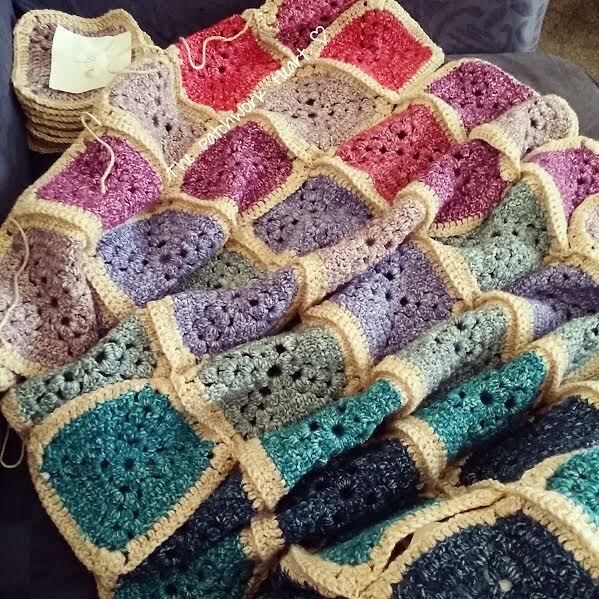 Beautiful work - love this blanket. Your blog is always my source for the perfect eye candy!! I find your blog so inspirational. 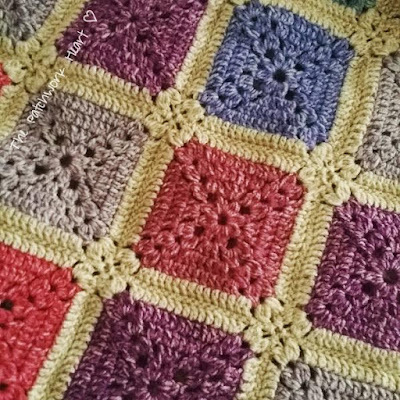 You seem to have the knack of posting just the right crochet item and colour recipe at the right time. 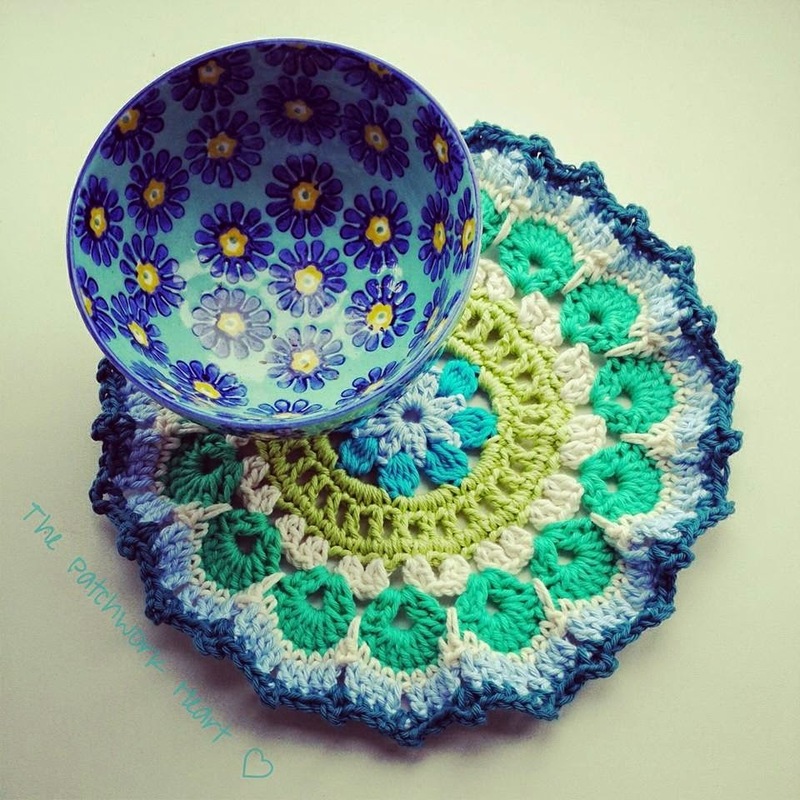 Every on of the items you post makes me want to get my hooks out and start crocheting. I was complemented the other day on how I always seem to pick just the right colour combinations and that is down to following your blog. Thank you Heather for being such a great teacher, as I could never work our the right colours to use before reading your blog. You have also inspired me to start my own craft group, which has now been going for nearly two years. Obviously I love the gorgeous creations that you make, which inspire me to create my own. 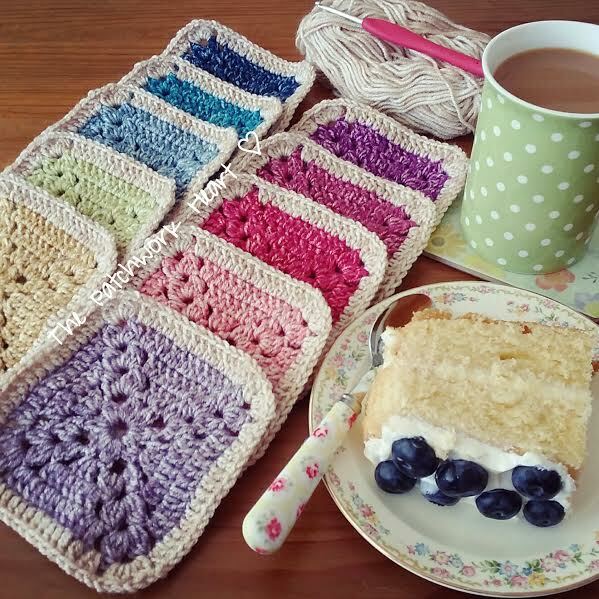 I enjoy the straightforward way you describe your methods ...it's a bit like having a chat about crochet with a friend, but without the tea and cake! Love your mug shots! And especially love your blankets-always beautiful colours! thankyou for inspiring us! I love this blanket 😍. I find your use of colours and textures so inspirational. Can't wait to see your next project! Hello Heather, I discovered your blog 1 year ago, and I started to follow you with enthusiastic curiosity..Since the begin you become my inspiration friend..I like your colour match and all your blankets..Thank you so much for sharing your love for crochet with us..Bises&Kisses. Elise, Wimbledon, London. I'm quite new to crochet and your blog has been an inpiration to me your colours and patterns are great. I must admit to loving your blog and especially your colour combinations. I get so much inspiration from them, as personally I can't match colours to save my life. I love your Blog Heather. 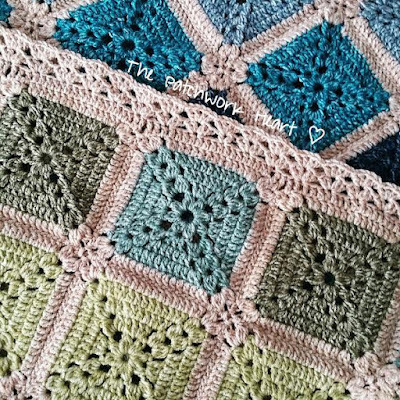 I especially enjoy seeing your wonderful color combos you come up with, as that is my weakness........keep designing and making your beautiful crocheted things. Oh my goodness!!!! I have fallen in love with your blanket & I love how you 'sudokued'the squares into the amazing new blanket. I like you like to make blankets & hopefully I will be in with a chance of winning the vouchers & I can buy the new Batik yarn foy own blanket. I have the yarn at the ready to get started on the carousel blanket come Tuesday. All your pattern and colour choices are so inspirational. You make me a better crocheter! I have waited to read your blog till this afternoon Heather. Peace and quiet and a beautiful hook to read and inspire. It's wonderful. I've followed you through your difficult personal time and am inspired by how you've turned your life around and are still doing something you love. Anyway, I've been inspired yet again and am hooking this beauty in Stylecraft special, which is lovely and will be gifted to someone needing a big cuddle. I would however love to hook this blanket in the beautiful Batik yarn and winning these vouchers would let me realise my dream. Oh, how I wish I lived in the UK! I'll answer you anyway. What I love about your blog is two-fold the mugs of tea and the detail you put into the posts. You make the projects sound 100% doable. I love all the colours you use and the instructions on how to achieve the cohesion of those colours. Hi, I love your choice of colours that you use when making any of your blankets. I have made notes of one or two, so that I can hopefully have a go at them. The Batik Blanket is stunning. Have found your blog today for first time. It is colourful, uplifting and inspiring. I usually double crochet on right side when joining squares but will definitely be trying from the wrong side. I love how homely your blankets are. The colours and styles inspire me to make a blanket bigger than my usual baby blankets!